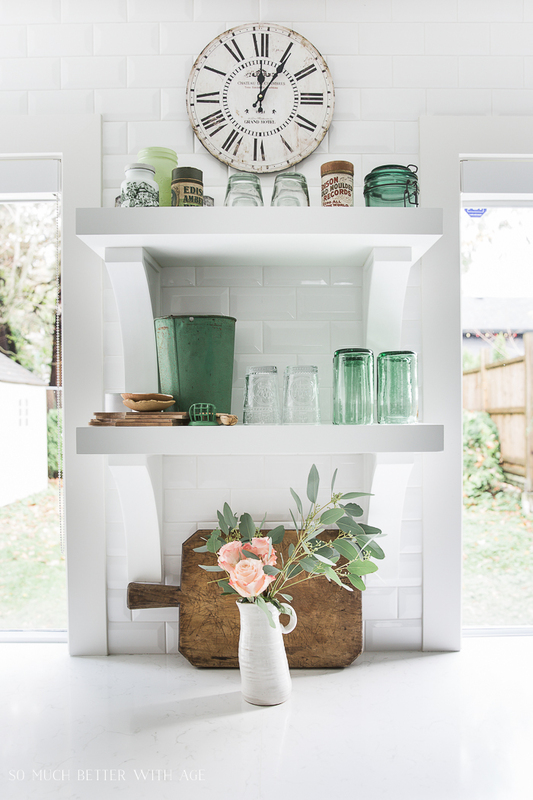 Learn shelf-styling tips and tricks you can implement today in your own home! 10 stylish shelf decorating ideas by bloggers. Decorating your bookcases, cubbies, and shelves is a great way to add personality to any room. Your shelves should be both stylish and functional. Let’s look at ten shelf-styling examples and learn why they work! Be sure to click the blue-gray links to be taken to the original source. Please click over to the original source for pinning. A special thank you to the bloggers who linked up their projects at the Tutorials & Tips Link Party held here every Monday evening! If you’re a blogger and would like the opportunity to be featured, please stop by on Monday evenings and link up your favorite projects. Keep a tight color scheme. I love changing up the shelves in my breakfast nook each season. When styling your shelves, a tight color scheme will help you stay focused and pull together a more cohesive look. Click on the link to see how I created these shelves. Remember to zig-zag your colors. Visual triangles are pleasing to the eye and Jamie from So Much Better with Age does a fantastic job of creating pleasing vignettes! Check her blog out for more inspo. When placing colored objects on each shelf, try going back and forth with your designated color to create visual triangles. To see more examples of visual triangles in effect, click here. 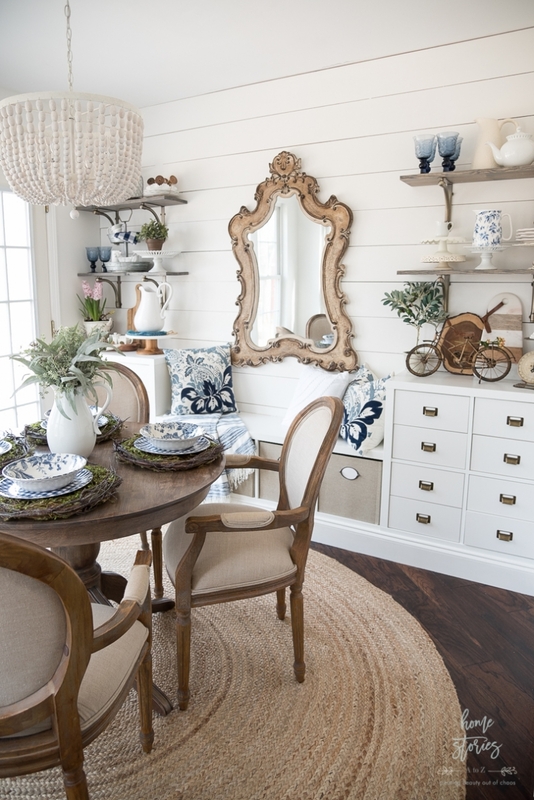 Use decorative crates and baskets to stylishly contain the clutter. 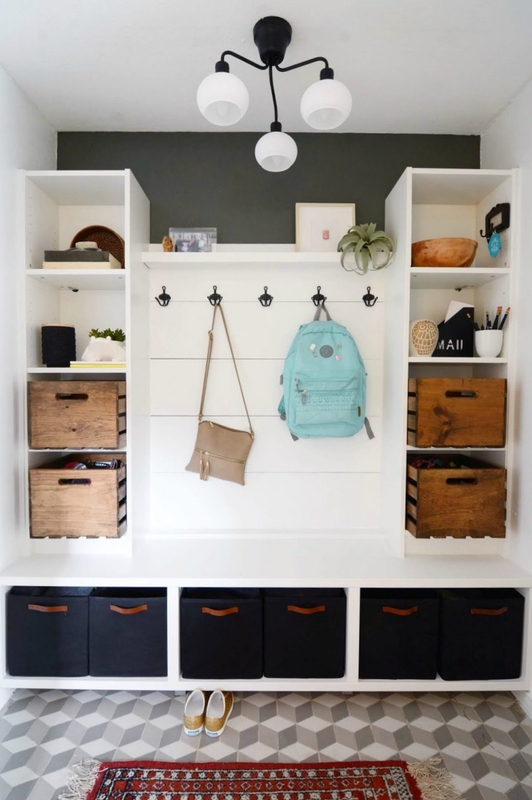 This styled mudroom by House Homemade is a perfect example of how to create shelves that are both beautiful and functional! Wooden crates, storage cubes, and decorative containers keep items neat, tidy, and chic. Group collections of similar items to create a beautiful display. 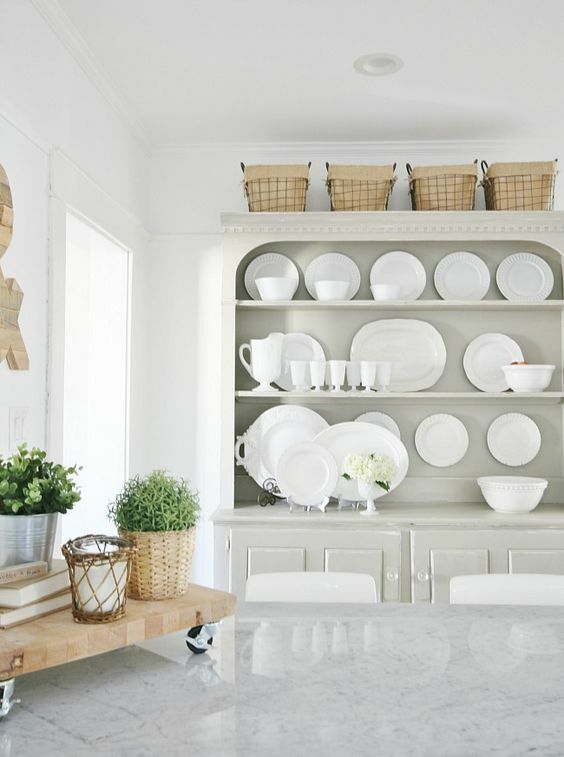 Don’t hide your pretty plates and milk glass pieces away in a cupboard! Group similar items together for a stunning and functional display. Display your copper collection! 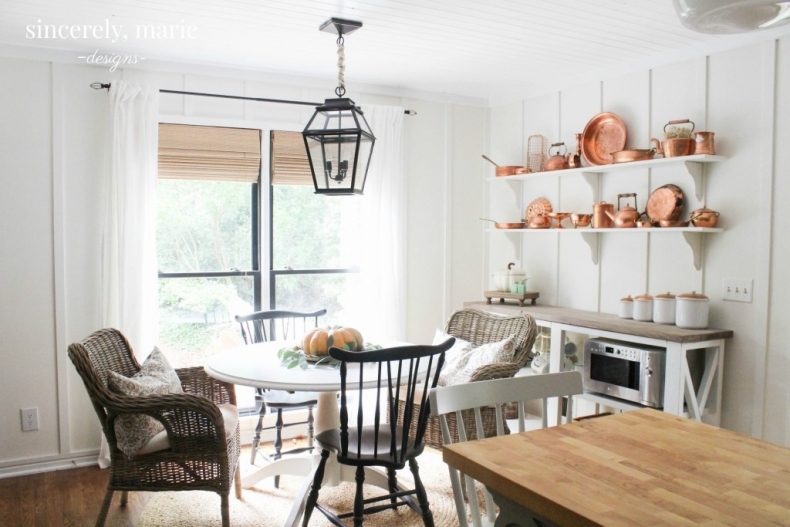 Copper has made a comeback over the last five years and it always looks cozy and beautiful for fall. Copper pieces can often be found for a song at thrift stores and second hand shops. Use functional items as decor. When styling your shelves, find way to incorporate everyday items into your shelf decor. 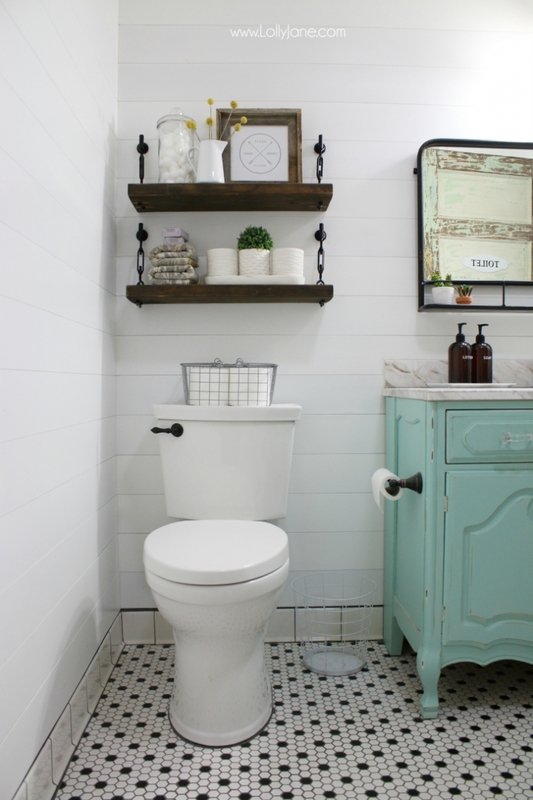 In the bathroom, toilet paper, cotton balls, q-tips and other bathroom necessities can be incorporated seamlessly into the decor by using beautiful glass jars, baskets, and chic containers. Use glass jars to corral themed items. Even if you’re not really using clothespins on a line to dry your laundry, they still look adorable in your laundry room decor! Display room themed items in glass items on your shelves. Pssst. 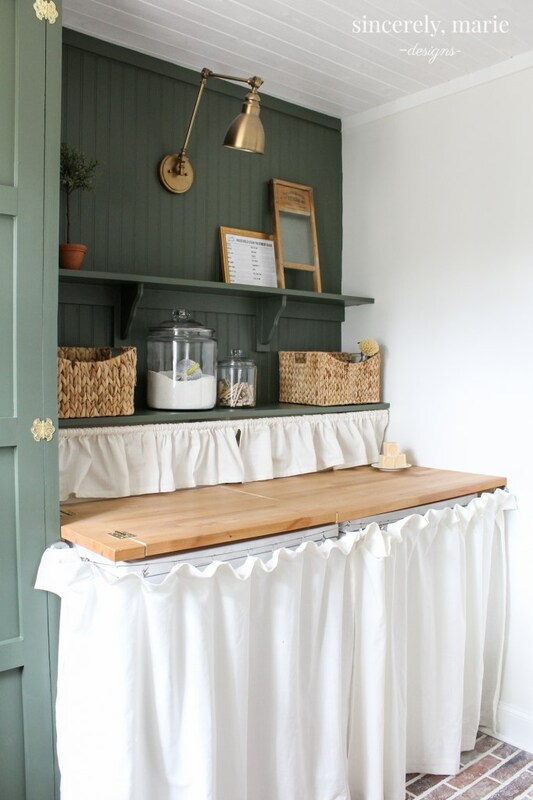 This laundry room has been made over twice, and the before is equally as beautiful. Go see them both! Always look for ways to incorporate meaning in your shelf styling! 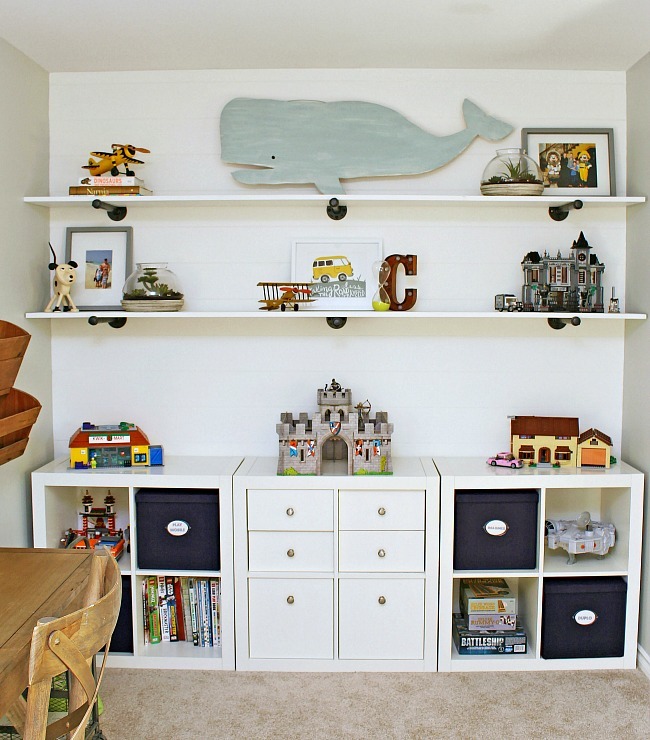 Kids shelves are a fantastic place to incorporate meaningful items. Display family pictures, lego builds, special collections, and meaningful toys. Group books by color for a fun display. Bookshelves were made to store books so don’t shy away from using them for this function. Consider grouping books by color to create an eye-catching focal point. Symmetry is your friend. Using symmetry on opposing shelves is always appealing. These bookshelves are styled very simple, but they have similar elements on each shelf and a beautiful symmetrical look. 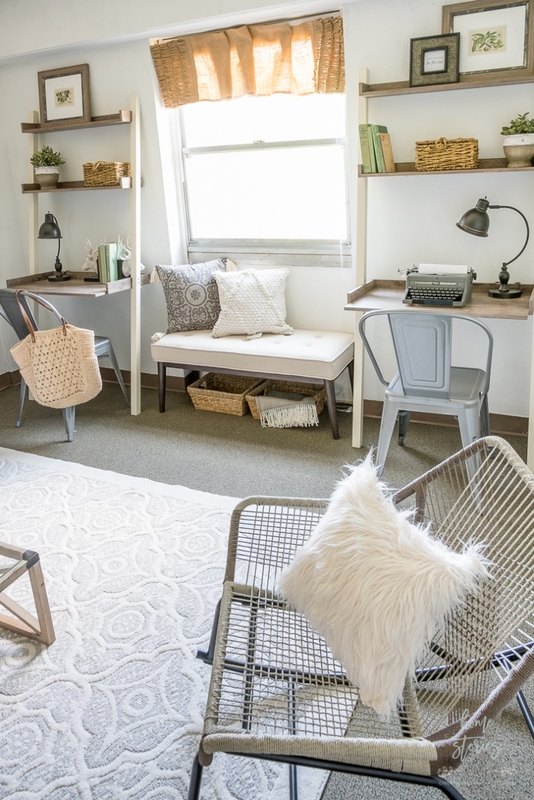 You can find the sourcing for the cute leaning desks, rocking chair, and pillows in this post.